The welding trade traces its roots back thousands of years through antiquity, and has given us some of our most important technological advances. Here at the Columbia College Welding Technology program, we'll provide the tools, training, and expert teaching staff to help you master this useful and practical craft to earn gainful employment in one of the numerous and diverse jobs available in the industry. The Welding Technology program provides the most comprehensive, complete educational welding experience in the Mother Lode. Our brand-new welding facility was designed by industry experts to include state-of-the-art equipment and included feedback from local industry leaders and educators. 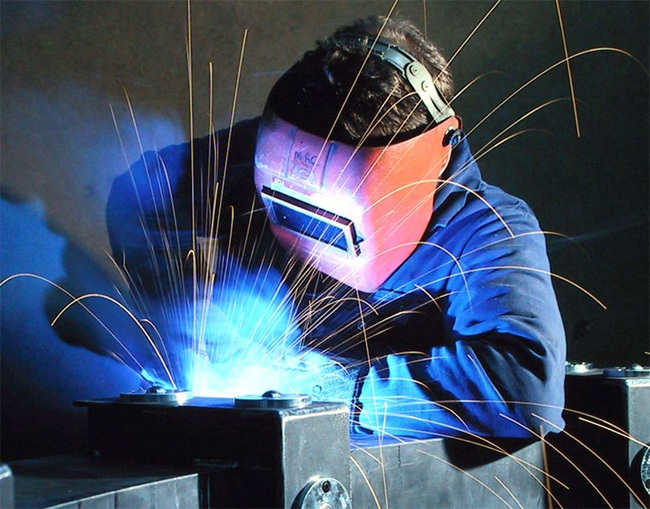 We offer training and education for a wide range of welding processes, including M.I.G. (Metal Inert Gas), T.I.G. (Tungsten Inert Gas), arc, and oxygen-acetylene welding, as well as metallurgy and creative metal sculpture work. Plus, you'll learn the process of interpreting blueprints in preparation for welding. Career opportunities include: agriculture; bridge repair and building; city, county, and state government positions; building contractors; fabrication shops; lumber companies; manufacturing firms; military positions; millwrights; truck and heavy equipment repairs; and much more. Those pursuing careers in welding should rest easy knowing that all Welding Technology program instructors are approved by the American Welding Society (AWS), and the program itself has received Level II accreditation by the AWS which ensures that all instruction is relevant and satisfies the national industry standards. AWS accreditation also enables students to achieve their AWS certifications through our program and its instructors. Our teachers are able to provide more individualized instruction due to our smaller class sizes, which gives students more time to learn basic welding procedures in specially-designed work booths where modern lab equipment is constantly maintained for students' use.